We are a well respected club playing in the Four Oaks area of Sutton Coldfield and run a range of senior, veterans, ladies and junior cricket teams. We offer indoor and outdoor nets training sessions for members of all ages with sessions being run by fully qualified ECB coaches. We also have our own bowling machine. We welcome playing members of all ages and abilities and offer social memberships for those who would rather sit and watch than play. We have good bar facilities and an active social calendar. The club runs four teams on a Saturday and one team on a Sunday. On a Saturday our teams play in the Warwickshire Cricket League. The 1st XI play in the First Division, 2nd XI in Division 7, 3rd XI in Division 10 West & 4th XI in Division 12 West. On a Sunday our team plays in Division 4 of the Lichfield & District Sunday Cricket League. Players over the age of 40 have the opportunity to play midweek cricket in the Warwickshire Over 40’s Twenty20 League. Our junior teams, including a thriving girls section, ranging from under 9’s u10s, u11’s, u12's, u13s up to u14's. We play in the local competitions organised by the Warwickshire Cricket Board League and South Staffs Youth Cricket Association.We are always on the lookout for people willing to help run more age group teams to give as many juniors as possible the chance to experience and enjoy competitive cricket. Friday 26TH APRIL - 5-6pm for 5-7yr olds and 6.15-8pm for 8-11yr olds. All the details of the exciting ECB starting programme for 5-8 yr olds including your own equipment can be found here ECB All Stars Info and Registration . ALL STARS sessions start on Friday May 11th for 8 weeks total. Registration for ALL STARS is only via the ECB All Stars website and costs £45 which includes personalised kit. In case Fridays don't suit, this year we are also offering an ALL STARS session on Wednesdays ( 4-8 yrs old) starting on May 15TH for 8 weeks - cost £45 including personalised kit. 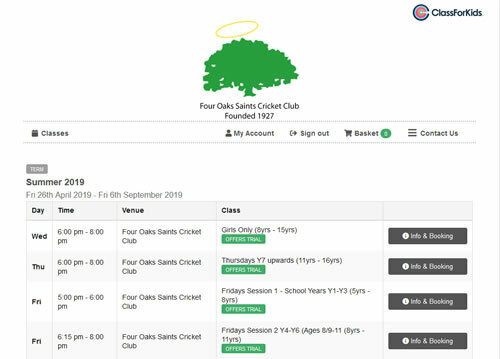 Any queries email juniors@teamsaints.co.uk or come to Registration night at club on 26th April and see Richard Daniels or Neal Hume. Have a great season and above all have FUN and ENJOY yourselves!